I'll be back in 2010. Today is our anniversary. 43 years. How many blog postings have I titled with those same words? As enjoyable as the knitting process may be, good fit is still the breath-holder. And so special when it happens. I'm dubbing this one, Winter Sunshine. It's a made-in-winter sweater (well, if you go by the weather, not the calendar) with a bright yellow colour that will bring much needed winter sunshine into my wardrobe. Machine knit on the LK150. Stitch Dial set at 8. Two yarns held together - Filati Sydney Superwash Sport Weight and On Line Supersock 100.
both purchased at the 2009 KW Knitters fair. Pretty quick stash busting, eh? Deep Vee - meets only at the waist where there will be three buttons. Pattern - My own. A knock-off 'out and out blatant copy', by me, of Chris Blysma's Fusion. The sleeve fit is growing on me. The length is rather 'fetching' and the fit isn't as tight as I first thought it might be. The sleeve caps are perfect. Excuse my immodesty, but how often does that happen? Give me another quiet afternoon or two and the sweater will be ready for it's public debut. Will it be 2009? or 2010? Well, well, well. Russell thought he had Survivor all figured out. Have you ever seen such a disappointed face? He has stamina, though. He held that long face throughout the entire hour-long show. It would appear Russell is used to getting his own way. It reminds me of something I read many years ago. The article stated that when people fail at what they do, the reasons are only 2% related to skills (or lack thereof) and 98% related to personality. That's Russell. Survivor's next season looks great. I wonder who will be staying in the villain's camp? And will they be there proudly or sadly? Knitting. Look what happens when you have a couple of quiet hours on a Sunday afternoon. 'r e a l l y' long, not-to-mention tight at the wrists. How did that happen? There might be a re-do involved. After Christmas. Writing interests me. I like to write, I like to read and I like to talk about writing. My niece (not newly-legal Katie, but Andrea) just got her first job. She is a reporter for the Shawville Equity in Shawville Quebec. Her first job, her first time living in other than a major city, her first time living in 'la belle province' her first time at - well all that first jobs entail and promise. labelled "Well-worded phrases I have enjoyed reading." In the book are some fabulous examples of great - to me, at least- writing. LOL LOL LOL That is writing. Or this excerpt from an article by Herman Goodden of the London Free Press on March 22, 2006 on becoming an empty nester. "...some subtle sound in the outer world, and we catch ourselves instinctively expecting a child to come strolling in. Whoops, we think. Those days are now gone and sadness sweeps over our hearts like a cold breeze." How accurately does that writing describe the feelings of the newly empty-nested? One doesn't have to be a published writer to impress me. Bloggers are terrific writers. Maybe there are bloggers who were/are published writers, but I imagine that the bloggers I read - all knitting bloggers - are just like me. 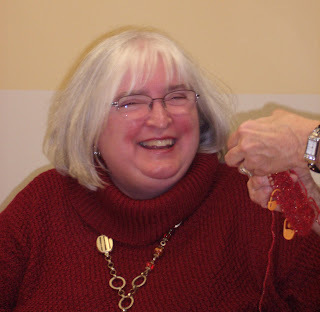 Interested in knitting and writing, using blogging as their outlet. 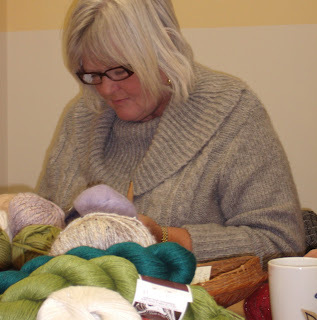 Just this week, Ruth Stewart from Knitting On Impulse wrote about her recent time of 'introspective hermitude'. Now that's a descriptive phrase. It's in my book now. And this week, too, Marie of Sel&Poivre wrote of avoiding the jobs on her 'to-do' list by blog writing. She describes it as " unrelated to the unrelenting." Another terrific phrase that's now in my book. One phrase that I read somewhere as a young person and have never forgotten concerns the correct use of public washrooms. I think of it when - well, you know when. It read " the germ-free, no-contact squat position that our Mothers all taught us." LOL. Another great phrase in my little book. Thanks to all who 'write'. Your art gives me much to brighten my day. Andrea, I hope to fill my little book with your well-worded phrases. And thanks to my elementary school teachers who taught me to read. The last knit group for 2009. There were goodies - did you think three wouldn't be? Watched over by Pat's latest knitted toy. Sandy came all the way home from Florida to wish us all Merry Christmas see her kids and grand kids at Christmas. She has a wonderful new scarf made with Kid Silk. Florida colours. while Wilma knit two hats and some mitts. Sharon is making mitts with Patons Classic Merino in a super colour combo. And all the knitters at Meaford Knit Group wish you and yours a Merry Christmas. The group while I took the picture. And the group with me in the picture. Despite not knitting for others at this time of year (well any time of year, really) and despite, this year, not having to prepare meals for large groups of people, the season seems to have seriously cut into my knitting time. This sweater, or rather, my version of that sweater, I am knitting on the machine. Those of you who machine knit know how fast that can be. For those who don't machine knit, think - lightning speed. It takes a bit of time to work up the math to get started (mind you, I do have a computer program to help with that) and it takes a bit of time to work out gauge on the machine. But once all the numbers have been worked out, the actual knitting time is very, very speedy. None the less, I have only three of five pieces done. Even knitting on a machine, one can get stranded on 'sleeve island'. The season is seriously cutting into my knitting time. I'm not sure, I will be wearing this for Christmas festivities. If I didn't enjoy the season so much, I'd be darn discouraged. Thursday, I braved the blowing snow to get to Knit Group. Food was being served - I will brave just about anything. But Friday, the blowing and the snowing was worse. I did not leave the house all day. Fortunately, for me, the mailman - despite sleet, snow, hail and all those bad-weather items listed in the mailman's creed - did leave his house. And delivered this to my house. YIPPEE!! Elizabeth Zimmermann's Green Sweater pattern arrived in the mail. Have you heard of this pattern? 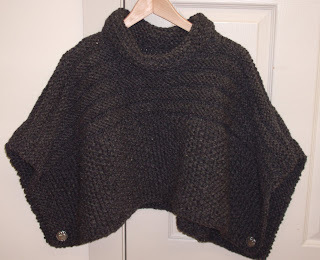 Originally knit by EZ for a teenage daughter of a family friend, and in sad shape after 50 years of wear. Luckily it fell into the hands of Sunday Holm who although not able to repair it, was able to 'read' it, in order to descipher the pattern. Schoolhousepress has published the pattern, and bless their hearts has managed to have some of the 'original' wool spun again. Due to overwhelming response, within the few hours that lapsed before I placed my online order, Schoolpress was advising knitters that the yarn was sold out. They suggested alternatives. I placed my pattern order and wonder of wonders, within a day or so, received a message that SHP was able to arrange for more yarn to be spun. They shipped my pattern and will ship the yarn when it's ready. EZ knit this sweater in the 1950s and the sweater was worn continually for over 50 years by the recipient and then her daughters. Knitting this sweater will be such an amazing knitterly experience.n Lucky for me, I will be using the exact same yarn that EZ used. The story of the Green Sweater is a knitting story that warms my heart. It is, after all, knitting history. To me, this knit will be so special, that even typing this post, one of those goofy, 'I'm happy as heck' smiles is plastered across my face. I can't wait. The needles are never idle for long around here. Sometimes the projects are quick and fun; sometimes they drag. Like this one. 'en -toos- iasm', I volunteered to make one for the store. Well!!! The yarn decided upon was Briggs & Little Super. 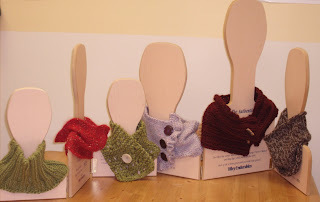 It knit to gauge. We had lots of stock. It seemed the natural choice. Now, I do love Briggs & Little yarns. I love the fact that they are Canadian. I love that they are the oldest continually operating mill in Canada. I love that they rose from the ashes of a terrible fire a few years back to spin again. I love that when you call there, you could be speaking to a Briggs or a Little. But I do have to admit to having never used their Super before. Super is very heavy. So heavy that it hurt my hands which meant that I could only knit on this cute, coat topper for short periods of time. And that meant that the topper took forever to complete. But it is done now. And cute it is. In the grey it would look great over a red or navy coat. I would make this again but in a different yarn. There are lots of bulky yarns with 'loft'. Loft makes the yarn airier, lighter. A lofty yarn would be easier to knit and lighter to wear. Sorry Mr. Briggs. And Mr. Little. The rest of your yarns I love. And for those readers basking comfortably in the warmth and sunshine of a warmer clime, here is our weather today. Despite the first, serious, snow-squall warning of the season, most knitters made it out to the Christmas lunch. Although my pictures seemed to have missed the frivolity, there was lots of laughter, good food and fun. Being the only exuberant, 'talk-with-my-hands' knitter at the table, I was the only one to bring my water glass crashing down on the table breaking it into several pieces. Oh well. No extra charge. After lunch, we headed off to knit. Gail liked the Martini Glass Dishcloth I took in last week and googled the pattern to make one for her friend. and when Sandy admired them, said " Merry Christmas. Please keep them." 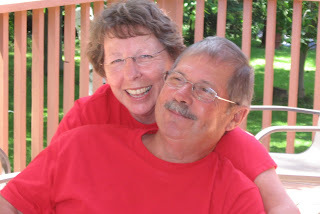 Sandy showed them off in her best Wilson (TVs, Tim Taylor's neighbour who never showed his entire face) pose. Here's Sharon doing her 'dog look'. She knit a little dog sweater. Slightly felted for extra warmth. Whatever happened to dog fur/hair? That is what used to keep dogs warm. On to Survivor. It amazes me that a rocket scientist and a doctor - both smart people obviously - haven't yet caught on to Russell. Will tonight be the night someone sees the light? Last night was Book Club and being December, the club does a Pot Luck dinner. I offered to bring dessert and this year made a new-to-me recipe. Doesn't that look wonderful? But, so easy it reminds me of those television ads where, before presenting a platter of Rice Krispie Squares, the cook splashes flour on her face to give the appearance of having worked all day in the kitchen. Last summer at the family reunion, my now-American cousin brought this same dessert. Both the appearance and taste immediately said 'keeper' to me. I am happy to share the recipe with you for all your Christmas entertaining. *One Tube - Sugar Cookie dough (In the refrigerator section at the grocery store where they keep Pillsbury Crescent Dinner rolls etc.) I've learned that this product is only available in Canada at Christmas time. All year long in the USA so if you are really desperate for a quick and easy dessert, at any other time of year, you might have to do some cross-border shopping. Roll cookie dough to fit a large circular cookie sheet. Bake as directed on the package. Let cool. Once cool, spread with cream cheese, then decorate with fruit. Oh - and don't forget to splash a little flour on your face. Appearances must be kept up. Saturday was Cowls For Christmas day at the store. What fun. The room looked lovely with all our cowls warming the necks of the display piece normally featuring travel hats. I set up the workshop to allow each participant to spend their class time making whichever cowl they wanted, meaning I didn't so much 'teach' as facilitate. Much more fun. They received patterns for all six cowls, enough yarn to make the class cowl and additional yarn to make two more at home. I think she's laughing because she conned me into fixing her mistake. And cookies, chocolates, coffee, tea and great knitterly camaraderie. I told them all they had to bring in their three finished cowls before Christmas. No pressure. With the skein of yarn I purchased from Islandsweet at Toronto's One Of A Kind show last week, I made this little shawlette. The pattern, you might recall me mentioning, I quickly memorized when the vendor explained how she made the scarfettes she had on display. She began by saying that she had started with the typical 'dishcloth' triangle - increasing one stitch at the beginning of every row. This, of course, makes a triangle that has 45' angled sides. Which she didn't like. So she began again by casting on three stitches. Then, on every row, increased ONE stitch at the beginning of the row, and TWO stitches at the end of the row. (I did my increases by 'knit front and back'.) This is really three increases at each end of every row. I'm not sure why she did it in two steps, - two stitches, turn, then one stitch - but since that is what the artist did, that is what I did. I copy well. And look at the lovely shaping it gave the scarf. Knitting often makes me wish I had more mathematical knowledge. Then I would know why this shaping occurred. Why I don't know, but it looks lovely. Each of her skeins had different yardage. Mine had 70 metres and my finished shawlette took all but a few inches of the yarn on 10 mm needles. This would work nicely with any bulky, thick and thin yarn. Colinette comes to mind. The finished shawlette is not large, but is the perfect 'splash of colour' on the blank canvas of a dark winter coat. Isn't this the best dishcloth ever? The Martini Glass Dishcloth. I must make more of these. Today, at knit group, I was reminded of something Marie from Sel&Poivre once said about our group. Marie would read about the great quantities of knitting accomplished each week by our knitters and asked if all the yarn in Ontario ran downhill to Meaford. She couldn't imagine otherwise how we managed to knit so much. Marie will be scratching her head again today, I'm sure. Wilma is busy with legwarmers. For grand daughters and daughters. All sizes. Aren't' they cute? It was decided that they make good leg OR arm warmers Whatever part is cold, I guess. and is on to Newfie mitts. while showing off the lovely flower for hat number two. Hat number three she left at home. Sharon brought the yarn she purchased at Romni Wools while in Toronto last week. And Pat, for a little something different knit slippers, not a toy. Last weekend seemed to have been a 'Meaford Knit Group Goes to Toronto' weekend. Sharon visited her daughters and shopped at Romni, Ingrid and I - although we didn't know the other was there - attended the One Of A Kind show, while Joanne went to a concert at Massey Hall. Now, Survivor. What will my pal Russell get up to tonight. Notice - he is no longer Mr. Nasty - but now my pal. I am beginning to admire him - still don't like him, but I do give him credit for how cleverly he plays the game. Makes for good TV.